Scottsdale Muffler & Automotive knows that while you may enjoy knowing that everyone on your block will be able to identify you by the sound of your car coming down the street, having a broken muffler is dangerous for the environment and for you. When a muffler has a hole in it, exhaust gases can enter the passenger area of the car, which you and your unfortunate guests then have to breathe in. As I am sure you know, inhaling Carbon Monoxide is no laughing matter, and not something you should be subjecting yourself or others to. By bringing your car into Scottsdale Muffler, we can quickly take care your muffler repair. Not only will you be able to enjoy breathing healthier air and the new found peace and quiet, but your neighbors will thank you as well. Specializing in Muffler service, replacement and repair, Scottsdale Muffler recognizes that one of the main sources of noise from most small engine or internal combustion vehicles, are the hot gases being forced out of the cylinder for every exhaust stroke. A Muffler’s main job is to dramatically reduce that noise. After some years, the gases released from the exhaust, that travel through the Muffler will leave a thick hard layer of soot or resin inside the Muffler that creates increased resistance to the gases exiting the cylinders. When this type of soot accumulates, it is best not to try repairing your muffler. When a Muffler shows initial signs of deterioration such as this, it is within your vehicles best interest to replace it. We offer a wide range of services from brake repairs and transmission fixes to oil changes and routine maintenance. This is for the car or truck enthusiast and is typically something done to enhance the horsepower and torque. You can get custom looks and sounds from the very loud roar to a quiet hum, depending on what you’re in the market for. We feature products from Dynomax, Flowmaster, Magnaflow and more high performance brands. Arizona custom exhaust installations and modifications can be done on any make or model. If you’re not sure what you’re in the mood for, or want to find out more, stop by our shop in Tempe. We’re located at 1710 E Curry Rd,. Or give us a call at 480-994-4741. Or you can email us at ScottsdaleMuffler@hotmail.com. There are many ways to reach us and we’re happy to help! As you may or may not know, the muffler is only one part of a vehicle’s exhaust system. The muffler is the canister and tail pipe that deadens the sound of the exhaust before it escapes from the car. The exhaust system consists of the header, the downpipe and the exhaust piping, down to the muffler at the end. If you have an issue with your exhaust system, you may not know it but some signs are feeling dizzy or nauseous while driving, or you hear noise from the area. Or you may see black sooty smoke coming out of the back of the car. That definitely indicates an issue with your exhaust system. Bring the car in to Scottsdale Muffler and let an expert check out the issues for you. Don’t mess around with the health and safety of your friends and family – not to mention yourself! Whether you want a race muffler to give you a slight performance edge at the racetrack, or you’re just looking for an aggressive exhaust to use on a specially modified suspension system, we can do what you need. You can do this on a performance street car, on Muscle cars, any type of truck and more. As a note, with the price of gas as high as it is – and only to go up in the future – an enhanced performance muffler promises increased miles per gallon. With a quality custom muffler, created by our expert craftsmen at Scottsdale Muffler, you won’t hear “noise” but instead the beautiful sound of power when you step on the accelerator. Before you do business with a vehicle repair shop ensure that they will be willing to give you a price quote after they take a look at your vehicle. In some cases they may be able to give you a quote even before they take a look at it such as if you need something done like tire replacement or need a specific part replaced. Remember, while getting a quote on a specific part is usually easy it’s the labor costs that can be in question. Make sure you get a quote on how much the total price will be including labor before you give the mechanics the go-ahead to start working on your vehicle. Scottsdale Muffler is a provider of custom auto fabrication and welding in Arizona. From hot rods to extending vehicles and restoring classic cars, Scottsdale Muffler has your fabrication needs covered. We can fabricate and weld extensions and custom pieces for any exhaust or airflow system, as well as providing body and frame extensions and aftermarket installations. Custom Auto Fabrication from Scottsdale Muffler can be the perfect solution for your auto repair or restoration work. When it comes to car repair, similar to plumbing and electric, it is best to let experts handle it. You don’t want to leave your vehicle repair in the hands of a lawyer and you don’t want your accountant to do a muffler repair for you! Getting a quality car repair by a Scottsdale Mechanic may seem like you’re spending more short term but long term it is absolutely going to save you money and headaches. Some things you can do on your own can be narrowing down the problem. For example, a bad exhaust noise may or may not be the entire muffler. You can check if it is the exhaust hanger if you hear an extra clunk underneath the vehicle, and you look down and see a broken black rubber exhaust hanger. It should be obvious, and it would be dangling if broken. You can repair this yourself, with a friend to help. There are easy internet instructional videos you can follow. If it is something less simple and obvious, go ahead and bring it to mechanics who are trained and know how to handle muffler repair. The majority of custom exhaust shops also do these types of repairs. Just make sure they’re a reputable place and you’re bound to be able to tell. Everyone’s had mechanics horror stories…and the lesson to be learned is do your homework and find someone who’s good when you need auto repair in Scottsdale Arizona. There are tips you can practice doing to avoid costly vehicle repairs and also to prolong the life of your vehicle. Get into the habit of checking your vehicle at least once a week and once a month at the mechanics. Things to pay attention to; is the engine oil level, brake-fluid level, radiator water level and listen for any strange noises coming from your car. Scottsdale Muffler is an oversimplification of the work we do. We are actually a full service auto repair shop and do everything from the most basic vehicle maintenance such as oil changes to the most comprehensive – including transmission and engine repairs. We work on every type of car from luxury sedans to mom-mobiles and pickup trucks. Our Arizona mechanics have experience in brake repairs, windshield repairs, as well as suspension repairs, fuses and more. Sometimes parts erode and need replacement, such as a battery and other times they simply need repairing. 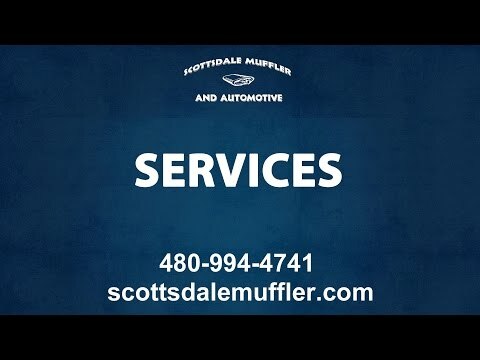 At Scottsdale Muffler, we will find the issue and correct it and make sure you’re not overpaying for it! When it comes to vehicle repair in Arizona you owe it to yourself to find a service that will take care of you from start to finish. You want nothing less than the best mechanics working on your vehicle so you can have peace of mind knowing that not only will your vehicle be fixed in a timely manner but also that you won’t be ripped off by unethical business practices. “Saving money” by failing to do routine vehicle maintenance will end up costing you more in the long run. As the old saying goes, “An ounce of prevention is worth a pound of cure”. By spending a small amount of money doing routine maintenance, your car or truck will last longer and run better for you. Some routine maintenance you may know about, such as getting oil changes or doing a coolant flush. Especially in a climate like we have in Arizona, a coolant flush is key to keeping your car’s radiator working properly. If you’ve ever had to drive around without working AC in July, you won’t want to do it again! There are also brake system flushes, as well as transmission fluid service and more. Not to mention tire rotations and alignments. At Scottsdale Muffler and Automotive we have the experience and tools that are needed to ensure the perfect car repair. You can depend on Scottsdale Muffler & Automotive for all of your vehicle restoration and customization needs. Here at Scottsdale Muffler & Automotive, you can depend on us to take care of your car, and to take care of you. Our Tempe auto repair shop is completely dedicated to providing the best service at the very best price in the area. We repair all makes and models, including fixing major drive train issues, and every day car problems such as starter motors, brake pads and more.